Jazz trumpeter Louis Armstrong shown in the upstairs den of his Corona, New York home, June 23, 1971. This week marks an unusual 50th anniversary: the last hurrah for one of the legends of American jazz and for a type of American music that, after this time, would never again be as popular. In the spring of 1964, the United States was going through a revolution. 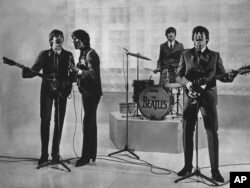 Three months earlier, the British rock band The Beatles appeared on United States television, giving the country’s younger generation something they been looking for - a way to differentiate themselves from their parents. “The youth of America is doing everything they can to be different than that generation that has come before,” said Dr. Tracey Chessum, a professor of Theater History at Point Park University in Pittsburgh, Pennsylvania. The Beatles are seen performing, date unknown. From left to right: Paul McCartney, George Harrison, Ringo Starr, and John Lennon. string of hits longer than any artist before them. A common question was when their streak of number-one hits would finally be broken. So was the question of who the artist to break their streak would be. “Would it be another hot-shot rock group? No! It’s Louis Armstrong. Here he is - he’s an old man. He’s 63 years old,” said Ricky Riccardi, the archivist at the Louis Armstrong House Museum in New York. And not only was it a shock that the Beatles were unseated by a 63-year-old, the song he did it with was about as different as you could get from the Beatles’ rock-and-roll. Armstrong had recorded this song a few months earlier, and Riccardi says, he almost didn’t record it at all. For one, at the time, “he’s not making many records,” he said. When Armstrong finally did get into the recording studio, Riccardi says, he recorded not only “Hello Dolly,” but also a song from the Broadway musical “Bye Bye Birdie.” It was that song -- “A Lot of Living To Do” - that was expected to sell a few records. Instead, things went in another direction. Armstrong’s “Hello Dolly” hit the market in January, right after the Broadway play opened, and in the midst of Beatlemania, didn’t stop climbing the charts until it finally knocked the Beatles from the number-one spot on May 9, 1964. But anyone who saw this as a trend would have been wrong. This would be Armstrong’s last trip to the top of the music charts, and as Tracey Chessum says, songs from Broadway musicals wouldn’t see many appearances on the pop charts either. Despite the long-term trends, for one last time Satchmo, as he was called, won the day. Armstrong showed with this record that there was magic left in his horn and his voice - that he could still create a hit. “At an age when most of his contemporaries were either dead, retired or unknown anymore,” Riccardi said.